If you'd like the outline version as shown in the second picture, just leave us a note in the comments box. 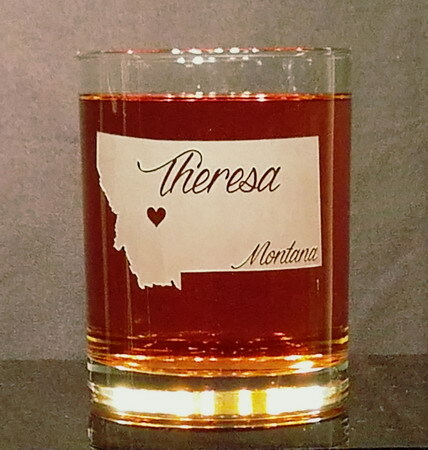 This 13oz Montana home state whiskey glass is personalized with the name of your choice and a heart located on your hometown. The state itself is what is sandblasted out of the glass, leaving the names and heart to stand out. Please leave the name and home town in the indicated boxes. If you'd like a different font, please let us know in the comments box. 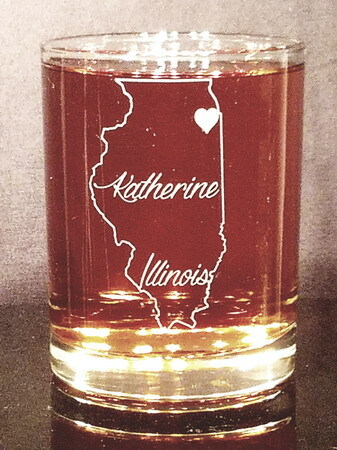 This whiskey glass makes a lovely gift! Like all of our glass and crystal, the work is done in our shop by us at the time of your order, we never send anything out. This glass is dishwasher safe. 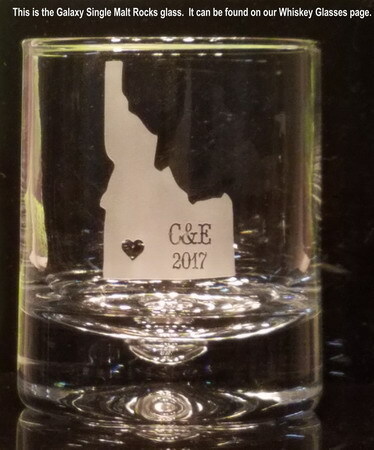 We can also use a version of the state with just the outline sandblasted out of the glass, or use initials, or any combination you like. Please leave a note in the comments box if you would like one of these options. The Finedge Double Old Fashioned is manufacturered Libbey. 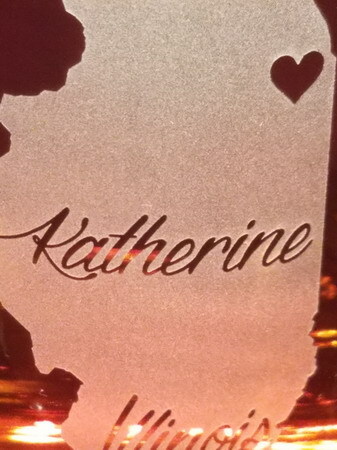 Each individual personalized whiskey glass page will have the number of lines and characters allowed below the picture. We do count spaces, but it is okay to go over, we're fairly flexible. Please keep in mind that the more text you want on a custom whiskey the smaller it will all be. If you'd like to see a jpg proof of your text and/or design please leave us a note in the comments box and we'll send you one before starting your order. We will be happy to work with you on your personalization ideas. Please note that this is likely to slow production time as we'll wait to hear back from you before starting your engraved whiskey. If you have any questions or concerns, please feel free to email us or give us a call or text at (815) 964-2080. We're open Monday - Friday from 8:00 am to 4:00 pm Central Standard Time.